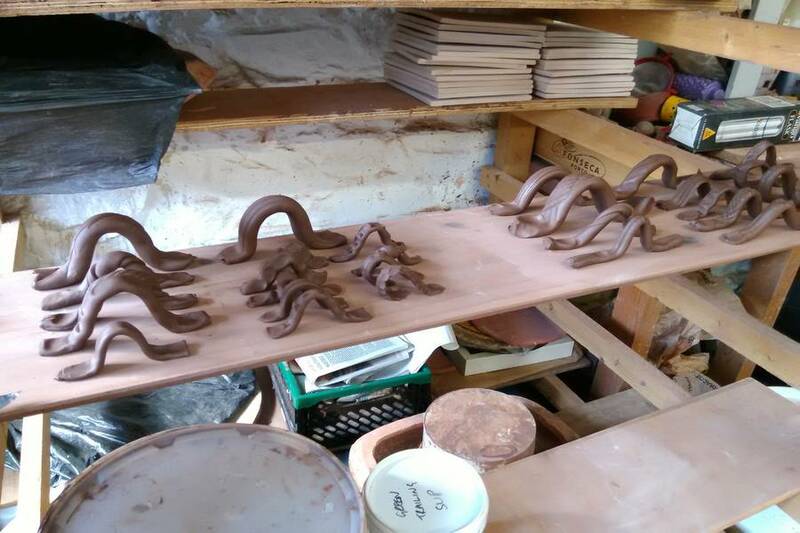 Alex McErlain was up this week to help with firing the wood kiln and to give us some lessons in handle making. Our first exercise was to make 20 differently decorated handles as quickly as we could. Not all of them looked amazing but it was great to experiment and play with different possibilities. We dipped our bisque fired pots into glaze ready for the electric kiln. When we arrived on Thursday the wood kiln was already started and we it was great to see how much attention is needed to keep it in optimal conditions. Alex taught us how to hand build espresso mugs and, once built, we considered what handles might best work on our cup. We unloaded the electric kiln and used our dishes for our wood kiln-side BBQ lunch!